First, I wanted to say thank you to everyone who has been part of my parachute these past few days. You feel like you're in free fall, and then you look behind you, and there it is: a beautiful, bright, vibrant thing, slowing your descent, cushioning the fall. I am lucky to have you all, the virtual friends and the ones I can reach out to touch. As you might imagine, I've been thinking a lot about friendships these past few days, especially female friendships I've made. Which is sort of ironic, considering that one of my most recent posts was about sisterhood, and how I was feeling like I came late to the table of female friendship. The friend I lost this weekend was the co-founder of the working mom's group I started (another irony, since I'm not currently working outside the home). She wasn't someone I necessarily would have chosen to befriend, except for our circumstances: she was also kicked out of the stay-at-home-moms group that we joined for companionship and support when there were no other alternatives (we joked about this for years). She wasn't and she was like me: unlike me, she loved her TV shows, she smoked, she was much more laid back than I am, she drove an SUV ... but more like me, she loved her children fiercely, she was smart, she was strong, and she was ready with a wisecrack or with an ear at just the right times. Together, we coalesced a diverse group of women who were negotiating the balance of work outside the home and the commitments we wanted to make to our families. The group has been through its ups and downs, and has been pretty quiet formally for the past year or so, but it still exists, and it was responsible for some unlikely life-changing friendships, even if we weren't the ones who were changed. Crisis has a knack for doing this, doesn't it? On the anniversary of September 11th, I also think about the friendships that were forged over that tragedy ... the people who happened to be in the same place at the same time watching in horror, or the people who had to cope, together, with the aftermath of unexpected loss, finding each other at the scene of devastation. Because sometimes, despite the best intentions of others, you simply need someone who gets it, someone who has been exactly where you were. And sometimes they can take you down roads you would never have traveled. The blogosphere is like this, too. There are certainly "tribes" of people that form, reinforcing the things we already share in common. We look for them, because they make us feel better about our writing and our belief systems. But there are also "circumstantial" connections that we make, happenstance meetings that change our writing, our career paths, our decisions ... sometimes our lives. And those are just as worth treasuring as the ones that mirror our experiences. When I lived in LA, I ran into an old acquaintance ... someone who'd had a thing for me back in college. He introduced me his high school friend and wife in San Francisco, and the wife introduced me to her friend, whom she made through an ex-boyfriend, in LA. The chain of coincidences that were required for me to meet this woman was dizzying. But it was one of the most important friendships I made when I was out there. C. was like everyone's older sister or aunt, and she took me under her wing. I have memories of going to visit her in her apartment, cats curling around my leg. Perhaps most importantly, I remember sitting with her on the 3rd Street Promenade eating pizza that claimed to be just like New York's best, talking with her about my dissatisfaction with graduate school. Her answer? "So why don't you leave?" It had never occurred to me that I could ... but I did. That chance connection, to someone I would never have befriended, changed everything. I really ought to catch up with her again. Today, be open to the happenstance connections in your life. You may be surprised at where they take you. Has a circumstantial/happenstance acquaintance ever changed your life? Though the memory is grainy like an Instagram photo, I recall us making these brownies in C.'s house one day, or was it a place I was housesitting? maybe after going out for Indian food. They were completely inedible as brownies; we had to use a spoon to eat them right out of the pan. But they were exactly right. I've since tweaked the recipe, and now you can actually cut them and remove them from the pan, but you do have to wait for them to cool. Otherwise, be prepared to break out your spoon. And no, these are not very attractive. 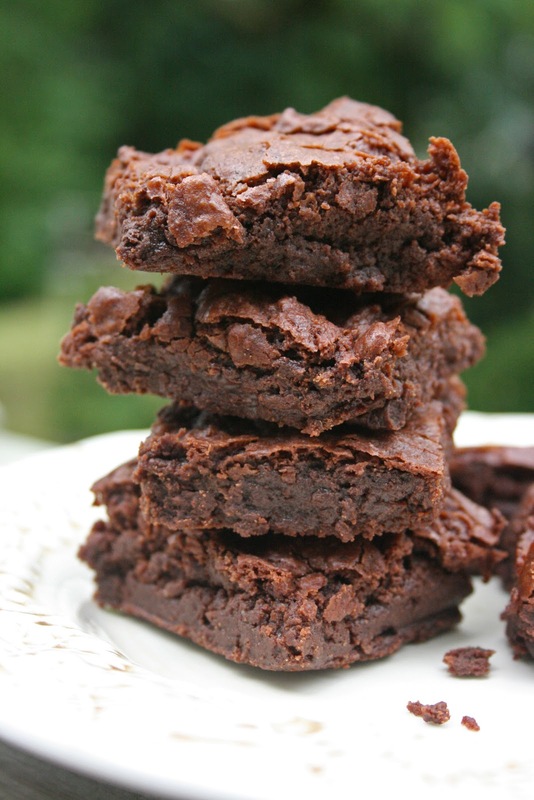 Do you really need attractive brownies? Spray a 9x9" baking pan with cooking spray. Melt butter in a medium to large pot over medium-low heat. Stir in sugar and water and mix until the sugar is completely dissolved. The water will want to do its own thing; don't worry about that. Remove from heat and stir in the chocolate until completely combined. Stir in the eggs, one a a time, and then vanilla. Mix well. Put some elbow grease into it. Resist the urge to lick the spoon at this point. Sift together the dry ingredients, then add to the pot. Stir well. You'll see that the mixture begins to look like one large mass of chocolate dough. That's right. Add the chocolate chips/chunks and mix briefly but thoroughly, so that they don't melt too much. Pour into the prepared pan and bake for 25-35 minutes, until a toothpick comes out gooey but not wet. Allow the brownies to cool in the pan thoroughly before you attempt to cut them, and then do so with a wet knife. Lori is that person. Googling brought us together (we like to joke that Peggy Orenstein was our matchmaker). How else could two people on two opposite sides of a country meet other than happenstance? And I can't imagine my life without her. "Because sometimes, despite the best intentions of others, you simply need someone who gets it, someone who has been exactly where you were. And sometimes they can take you down roads you would never have traveled." I talk about this often with my friends that I met through the perinatal bereavement support group I have been going to for six years now. They are friendships that formed because we have all experienced pregnancy loss and/or infant death. As time marches on very few of our family and friends that have not lost a child "get" what it is like for us to go on living without one or more of our children here with us. So we are grateful to have each other to be able to speak freely about the babies we lost with others who understand the pain and the joy they brought (and continue to bring through their memories and legacies) to our lives. My husband and I often talk about the friends we have here. They are not necessarily the friends we would have chosen if we lived a less isolated life. Many of our friends are in different life stages or have very different core values to ours and sometimes that makes the friendship challenging but other times it forces us to look for the common bonds that are always there but that aren't always apparent at first, or it forces us to question our own core beliefs which I think is healthy. So while many of our friendships have started because of circumstance and proximity they have enriched our lives as much as the friendships we made in NYC where it was much easier to surround ourselves with a like minded group of people. I have been thinking about you a lot since your last post and I am so very sorry for your loss. Once again, your words are crystal clear and true and beautiful. I am a firm believer that when we are open, God will bring to us all that we need...and many times people that we feel like we have always known...and need to know. My husband teases me that I make friends everywhere I go, but the truth is, I always feel better making these connections versus going about my day with my head down and a to do list that doesn't even matter. Look at us - a bathroom resulted in who even knows what yet?!! Yes. Way back when, about 10 years ago now, I was unemployed and a marketing professional. I happened to have a conversation with a girl at a Halloween party about what she was doing - she worked at a big public accounting firm and knew they needed people. It's hard to imagine the chain of events that happened next. I sent my resume and they told me they weren't interested because I needed the classes in order to sit for the CPA exam. Which led me to a masters program at Boston College, and they HAPPENED to be accepting students for the January class. I applied, was accepted, started the program, FINISHED the program - WITH a Masters Degree - which took me 8 months, in total. By the time we met up at next year's Halloween party, I had a new Masters degree, I was sitting for the CPA exam the following weekend, AND was working for the same firm she was. And it's set me on a path where I have some flexibility to create my own hours right now. It's sort of amazing how a chance conversation can alter the course of someone's life: ripples in a pond, and such. I'm so sorry for the loss of your friend, thankful you felt surrounded by love as you begin to grieve for her. It is amazing how people enter our lives in some of the most unpredictable ways isn't it?! Now that I think about it some of my closest friendships have started this way. I am sorry for your loss. I am lucky, and young, to have had few friends pass away, yet I anticipate it. I try to treasure every meeting and be in the moment with them. My wonderful college roommate was one of those people who randomly stumbled into my life and we have always been in contact. Sometimes we don't talk for a month or 6, but when we do it only rekindles our connection that never left. On a side note, the brownies look amazing. I love your point about the blog-o-sphere - you capture that so well! It can be so powerful connecting with people who are "like us" but just as powerful crossing paths with people who aren't and learning from them. Ooo, and I want to make those brownies! I am so sorry about your loss. I hope you continue to find comfort with friends during this time of mourning. I'm glad you've felt supported these last few days. I'm so sorry for your loss...I can't imagine.